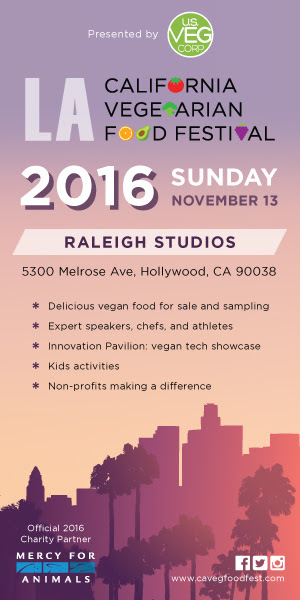 A vegan vibe descends on Raleigh Studios Hollywood, Sunday, November 13, as U.S. Veg Corp presents the California Vegetarian Food Festival. The California Vegetarian Food Festival, far from being your run-of-the-mill food festival, combines delicious food, fun entertainment, timely topics and informative activities for the whole family. The event features vegan food and lifestyle vendors, top-drawer speakers, hands-on activities for children, exercise classes, cooking demos, and roving entertainers. In the same vein of the NYC Vegetarian Food Festival and the AZ Vegetarian Food Festival, this is a must attend event for adventurous consumers from all culinary proclivities, not just vegans and vegetarians. Speaking on “How to Turn the Most Important Trend into a Long-term Lifestyle” will be registered dietician Julieanna Heaver. She specializes in weight management, disease prevention, and sports nutrition. Heaver is also the host of the wellness talk show series What Would Julieanna Do? on Z Living Network, the author of The Vegiterranean Diet and The Complete Idiot’s Guide to Plant-Based Nutrition, and the nutrition columnist for VegNews Magazine. On a similar theme, Rachel Avalon will describe “Advanced Strategies for a Sustainable Diet & Lifestyle.” Avalon is a holistic health coach and the creator of the Avalon Cleanse. Her work has been featured in The Huffington Post, on Alicia Silverstone’s The Kind Life, and in Llewellyn’s Complete Book of Mindful Living. Fitness is integral to healthy living so the festival features a Fitness Area complete with classes given by such talents as former New York Giants wide receiver Ramses Barden. The super-athlete now operates Soul Glow Sports, which has been described as a marriage of football and dance. Another fitness expert, John Lewis, will talk about his “Plant Powered Positivity.” Lewis played Division I college basketball, and now delivers motivational messages through his public speaking engagements and social media outlets. Matthew Kenny Culinary is the chef demo stage sponsor, and it will be helmed by Kaitlyn Misheff. Celebrity chefs on tap to share some of their cooking secrets include Jason Wyrick (of The Vegan Taste), Joni Marie Newman (presenting her Texas Hold ‘Ems), and Julie Morris (serving up Superfood Soups). A sampling of the festival’s food and beverage vendors are Best Gumbo In The Hood, Cedar’s Mediterranean Foods, Iss’ Magic Mixes, Vegan Pizza, Revive Kombucha and Laurelwood Brewing Company. Sweet tooths can be indulged by Vegan Dots, Rescue Chocolate, International Desserts & Delicacies, and Badass Power Cookies. For vegan clothing shoppers, there will be apparel exhibitors such as Vegetaryn, Oh Kale Yeah Tees, Guerrilla Wear Fare, Humane Project, Wills Vegan Shoes, and BeetxBeet. Several non-profit groups will also be on hand alongside this year’s festival’s charity partner, Mercy For Animals. Parents looking for something to do with the kids, look no further. The dynamic Kumquat Kids Area will be captained by Dr. Andy Mars, best known for founding the KidsLA enrichment programs. Mars brings two decades of experience in directing camps, consulting with schools, providing teacher development, tutoring students, and accommodating learning differences. He serves on the Board of Trustees of the American Vegan Society, the Earth Harmony Foundation, and the Children’s Arts Trust. At the festival, he will present a talk on “Raising Veg Kids” and will also oversee the crafts and storytelling activities for the children. The California Vegetarian Food Festival runs from 10 a.m. to 5 p.m. on Sunday, November 13, rain or shine. Raleigh Studios is centrally located at 5300 Melrose Avenue, Hollywood, CA 90038 and features convenient parking at 662 Van Ness along with nearby street parking. To purchase admission tickets, visit our ticket page. Kids 10 and under are always free.